We have a lot of great events coming up (as usual), so get out those calendars and mark it for all the ones you are coming to. Or just print off the schedule and put in on your fridge. Summer Camps fill up fast! Click here for more information! Need resources? Check out the resource guide through Parenting Children With Special Needs magazine. Click here. Petunia's Baskets - Pick up a free basket for a special needs child or family. Click here for flyer. April 5 : Healthy Homes Principles for Home Visitors/Staff half day event at eitas. Click here for flyer. April 7: Autism Awareness Day at the Kansas City Zoo - free admission! Click here for flyer. April 12: SOAR R&R with Easter theme. Click here for more information and registration. April 17: Company of Champions Bingo. Click here for flyer. April 18: Healthy Homes Principles for Home Visitors/Staff full day event at eitas. Click here for flyer. April 20: Autism Outreach Event/Special Needs Day, Lee's Summit. Details to follow. April 23: Thompson Center Autism Parent Conference for family members and caregivers. Click here for more information and registration. April 26: Jelly Bean Dance sponsored by Jackson County Parks + Rec. Click here for flyer. April 28: DPI Trivia Day at KC Bier Co. Details to follow. May 12 - 18: Charlie's Car Wash fundraiser to benefit DPI. Click here for flyer! May 19: Eitas camp scholarship deadline. Click here for scholarship application. June 3 - 27: Elks Mobile Dental Program at Blue Springs Elks Lodge serving Jackson and Lafayette Counties. Free dental care for children an adults having intellectual and developmental disabilities. Call 573.690.6003 for appointments. Capacity is limited. 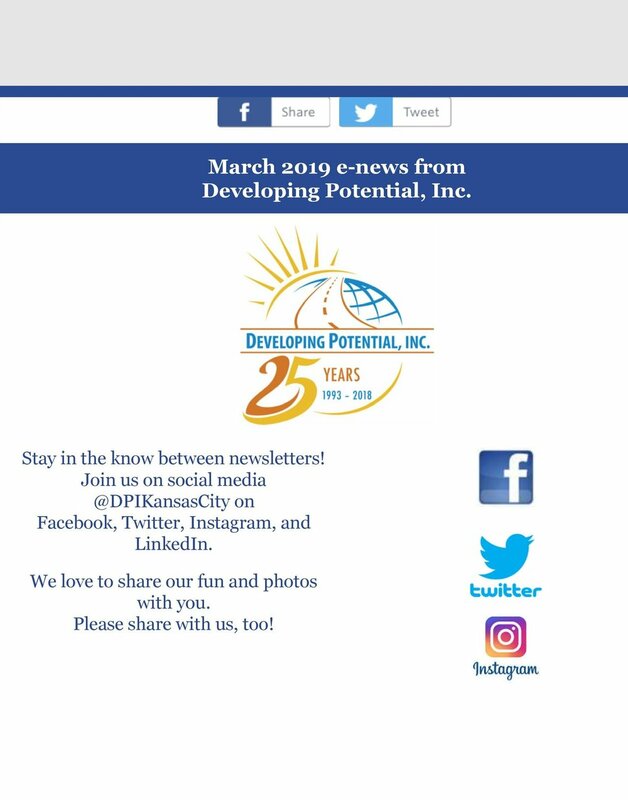 June 5: DPI Take Me Out to the Brewery event at Boulevard Brewing! Mark your calendars, details to follow! July 29 - August 8: Elks Mobile Dental Program at Harrisonville Elks Lodge serving Cass, Bates, Henry and Johnson Counties. Free dental care for children an adults having intellectual and developmental disabilities. Call 573.690.6003 for appointments. Capacity is limited. September 21: Autism Speaks Walk, Click here to register. Join us at Chipotle on Monday, January 21st. We are excited about our upcoming Annual Gala to thank the many community supporters we have in the Greater Kansas City area. Please join us on November 10th at Unity Village at 6:00P. Activities include a Wine Raffle, Guest Speakers, Art Auction, Recognition Awards, and a Live Auction which features a trip to Cabo San Lucas, so don’t miss out! Grab some friends and influencers for a fabulous night. All of the details on how you can be a part of the fun are on our Gala Page. Check out what’s coming up for DPI! Thank you for your support. 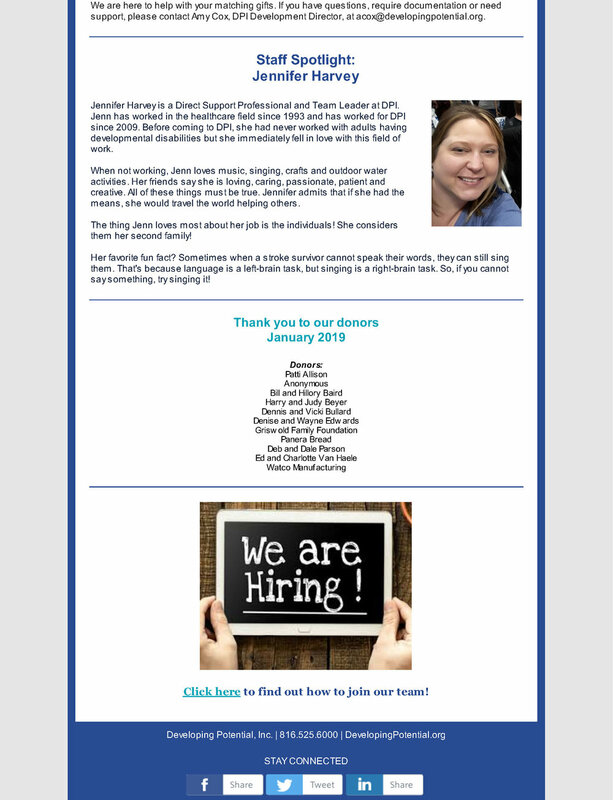 Click here for our September e-News! We want YOU to see all the latest News. Summer is here! Click for our June/July Newsletter with all of the events, celebrations and employee spotlight on Casey Hill. Be in the know and get all the activities for June and beyond here! 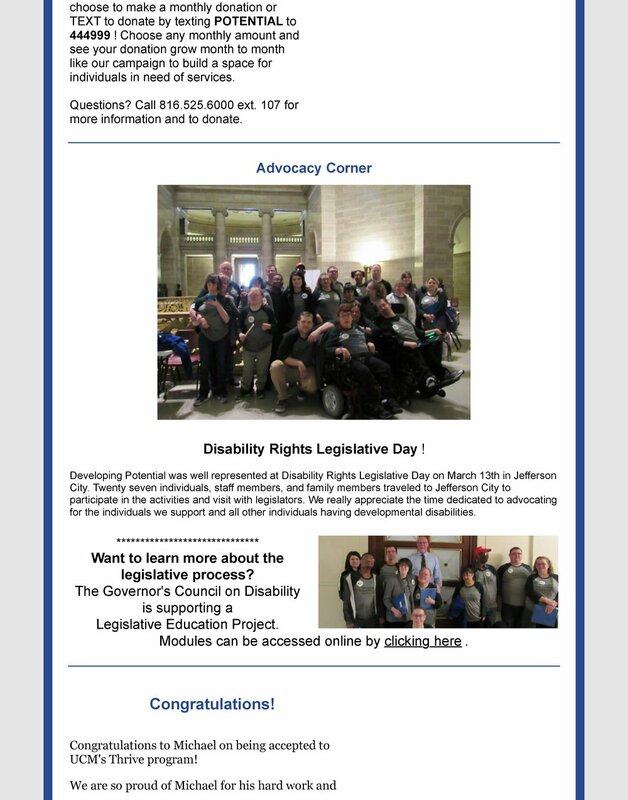 Thank you for your support of DPI.